I have always been a huge fan of salsa and love trying new kinds. I was thrilled when Gunther's Gourmet agreed to send me some samples of their salsa for my review. 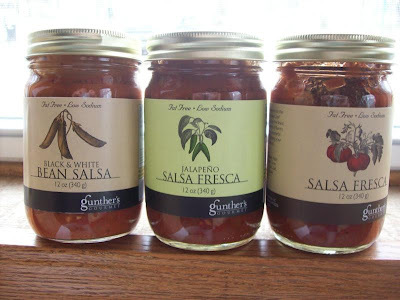 I chose the salsa fresca, jalapeno salsa fresca, and the black and white bean salsa to try. The company also sells marinades and vinaigrettes too. The other night, my husband and I made delicious tacos with ground venison, pinto beans, tomatoes, lettuce, cheddar cheese, sour cream, and this salsa. We tried the salsa fresca and liked it. It is very different than other salsas in the way that it is has more of a chili powder taste than most. I think that it would be very good cooked in a recipe like with burritos, over chicken, or on top of a baked potato also. My favorite of these salsas is the black and white bean salsa. I love beans in my salsa and this one tasted great. Thanks Gunther's Gourmet for sharing your delicious products with me.